Catalysis, in which "helper" components speed up chemical reactions without themselves being consumed, is as useful to modern industry as it is essential to life itself. Biological catalysts are proteins known as enzymes. Many industrial catalysts are metals. Iron, for example, is used to promote the reaction of nitrogen with hydrogen to synthesize ammonia. Platinum -- among a host of important applications -- encourages the formation of specific long-chain hydrocarbons, thus increasing the octane rating of gasoline. In automobiles, platinum-based catalytic converters convert engine exhaust to water and other benign byproducts. Designing catalytic systems to be fast acting and long-lived, and to form only the desired end products, has long been a major challenge. In many of these processes a stream of reactants, often at high temperature, is passed over tiny particles of metal on an oxide support surface. "As long ago as the 1920s, industry began depositing metal particles on a support surface by precipitating salts from solution," says Gabor Somorjai of Berkeley Lab's Materials Sciences Division. "The trouble is that these particles vary in size, and their spacing is random. Our work has established that many catalytic reactions are sensitive to particle size. The distance between particles is also important in secondary reactions, including those that can 'poison' the catalyst." For the last five years Somorjai, who is also a professor of chemistry at the University of California at Berkeley, has devoted much of his attention to creating "high-technology" catalysts that are stable at high temperatures, resistant to poisoning, and -- like nature -- 100 percent selective; he notes that "biological processes are often catalyzed with 100 percent selectivity." Selectivity is important environmentally as well as economically, he says. "You can increase the octane rating of gasoline remarkably if you start with n-hexane and catalyze it over platinum; what you want to make are branched isomers, which are environmentally benign. But there are at least seven or eight directions the reaction can go, all of them thermodynamically feasible. It can produce gases by breaking carbon-carbon bonds, which is the last thing you want to happen, or it can go to aromatics which, although they are high-octane products, are cancer-causing molecules." Recently, Somorjai and his group have obtained intriguing results using ordered platinum "nanocluster" arrays. Controlling the size and placement of platinum particles only billionths of a meter across was a daunting challenge; to meet it, they had the help of Eric Anderson, head of the Laboratory Materials Sciences Division's new Nanowriter facility at the Center of X-Ray Optics, in employing electron-beam lithography, a fabrication technique borrowed from microelectronics. "We coat the oxidized silicon crystal with a thin film of polymer, then use an electron beam to burn a pattern of holes through the polymer to the substrate," Somorjai explains. "A platinum film is then evaporated onto the polymer, and it fills in the holes; when the polymer is removed, we are left with platinum clusters of uniform size and spacing." The result is a wafer of silicon oxide half a square centimeter in area, covered with a billion particles of platinum spaced 100 nanometers apart. In a recent experiment, particles examined with an atomic force microscope and a scanning electron microscope were found to be some 20 nanometers in diameter and about 15 nanometers high. Initially each metal cluster was polycrystalline, consisting of several crystal domains. 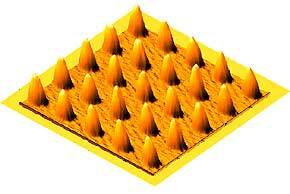 Under sufficient load, the tip of an atomic force microscope could break off some of these clusters. But after the wafer was heated, the crystal domains grew together into single crystals of platinum that could no longer be easily broken. Catalysis tests were run in a special reaction chamber designed by Somorjai that allows different reactions at different pressures and temperatures. Two similar chemicals important in industry, cyclohexane and benzene can be converted into one another by adding or removing hydrogen atoms. Both molecules have 6 carbon atoms; in benzene each carbon is paired with a single hydrogen, in cyclohexane with a pair of hydrogens. Increased pressure tends to add hydrogens, favoring cyclohexane; increased temperature tends to free hydrogens, favoring benzene. In both reactions, the nanoparticle array was much more efficient and selective than small foils of pure platinum or wafers of pure silicon. Curiously, reactivity remained high even after the platinum surface in each cluster had been greatly reduced. "Between each test we cleaned the catalyst, shaving off any organic 'dirt' by bombarding the wafer with a beam of ionized neon," Somorjai says. "At the same time, the beam planed down the platinum clusters, until eventually the surface area was only 40 percent of what it had been." Nevertheless, the nanoarray catalyst remained 20 to 30 times more active than the platinum foil. "This led us to realize that it wasn't just the metal that promoted catalysis. The interface between the metal and the oxide was much more important that anyone had previously thought." For Somorjai's group, the work ahead involves basic science -- such as understanding the role of metal-oxide interfaces by investigating different metals, bimetallic systems, and oxide supports, and also testing the nanoarray systems with multi-product reactions -- and technology as well. The biggest practical challenge is scale-up. "In industry, the quantity of the product is proportional to the area of the catalyst," Somorjai says. "Half a square centimeter is very small -- we need to find a way to produce uniform nanocluster arrays with hundreds of square meters." Cheaper, faster methods of lithography, perhaps involving stamping multiple copies of array patterns from "masters" (rather like the way the music industry used to make vinyl records), are one approach; another is to produce arrays in three dimensions, "like a multi-level garage," says Somorjai. More unusual three-dimensional structures are also under investigation. Armed with the knowledge that the metal-oxide interface is crucial to catalysis, and having demonstrated high efficiency and selectivity with single reactions, Somorjai and his group are poised "to move the whole field of catalysis into the high-tech mode."